By now you’ve accumulated plenty of documents—music, movie, image, text, and PDF files—and at this point you may want to do something with those files beyond flinging them into folders. One of the best ways to get any such doing done is to double-click them. Try it and their default application opens. In the case of pictures and PDFs, that default application is Apple’s Preview. As its name implies, Preview is designed to let you view documents. But it doesn’t have mystical all-seeing powers. Rather, it confines its talents to image and PDF files. Preview’s ability to open image files is very broad. The application supports the major image formats—including those that bear the bmp, gif, jpeg, pict, png, and tiff extensions—as well as rarer file types. And it can export images to most major file types. In addition, you can use Preview to lightly edit these files. For instance, if you need to cut Cousin Jo-Jo out of a photo, you can use the Crop tool to do just that. You can also rotate images, adjust their color and size, annotate them, and select specific portions of them (everyone but Cousin Jo-Jo, for example). Similarly, you’re not limited to viewing PDF files. You can combine multiple unprotected (meaning not locked by the document’s creator) PDF files into a single document; rearrange their page order; and annotate, crop, and sign PDFs. Because Preview’s abilities go beyond the obvious ones, we have a fair bit of ground to cover. Consequently, we’ll concentrate on images this week, and In the next lesson we’ll turn our attention to Preview and PDFs. You have various ways to open images in Preview. The easiest is to double-click a compatible image file (or group of selected files). By default, it (they) will open in Preview. Alternatively, you can drag images to the Preview icon in the dock. Or within the Preview application, you can choose File > Open and navigate to the image you want to open. 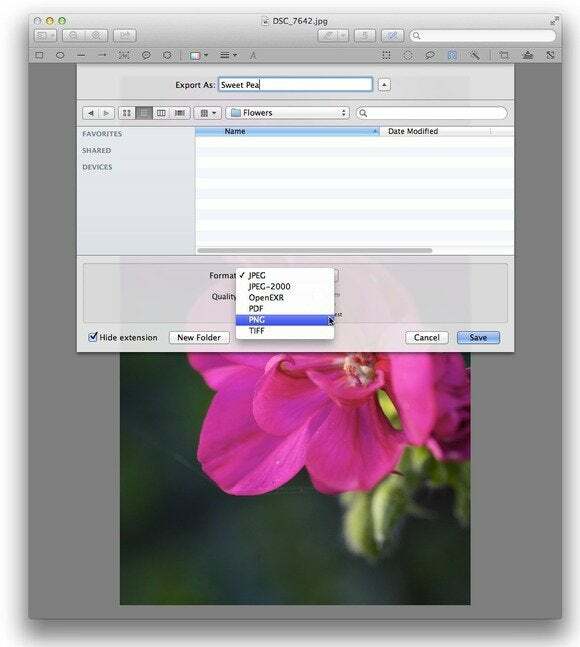 Use Preview's Save As or Export command to convert your images. If you have some objection to touching the Option key (and really, isn’t it time you got over that? ), choose File > Export. You’ll see the exact same sheet with the same options in the Format pop-up menu. Before converting your images, you may wish to muck with them. For instance, you may find that an image you’ve opened is rotated 90 degrees the wrong way. Or that darned Cousin Jo-Jo may have crept into the outer edge of an otherwise lovely family photo. Let’s now look at some ways you can use Preview to edit your images. To begin, choose View > Show Toolbar (if the toolbar isn’t already present). In addition, choose View > Show Edit Toolbar. You can flip images, too. When you choose Tools > Flip Horizontal, the image flips around so that objects that were on the left are now on the right, and vice versa. If you choose Tools > Flip Vertical, the image appears upside-down and backward. Crop: If you haven’t learned this trick by now, let me catch you up. You can greatly improve many images by cutting out extraneous or distracting material—the kid who expresses his displeasure at the camera by jamming out his tongue, or an element-choked screenshot that hampers the viewer’s ability to focus on the subject of the image. This is where cropping comes in. When you crop an image, you scissor out material you don’t want to see. By default, the rectangle selection tool is the active option when you open an image. 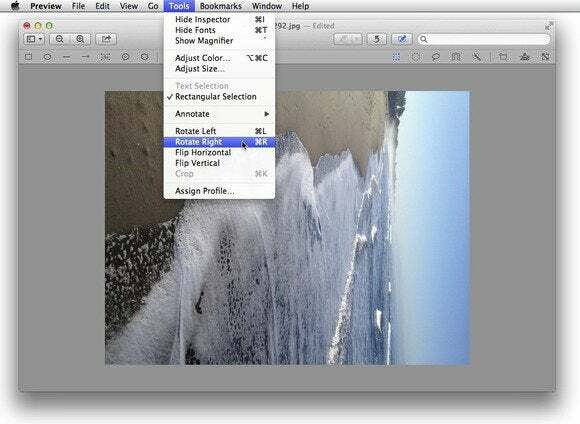 To crop an image, simply click and drag over the portion of the image that you want to keep. If you don’t capture the selection exactly right, just click and drag one of the eight handles (which appear as dots around the edges of the dotted selection border) to resize the selection. To impose the crop, choose Tools > Crop (or memorize and use the handy Command-K shortcut). Do this and you’ll be left with just the portion of the image that you selected.